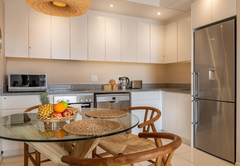 Antrim Villa Apartments is a property providing self catering in Green Point for tourists visiting the Atlantic Seaboard region. 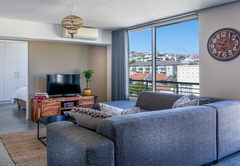 Antrim Apartments are contemporary, fully furnished self-catering apartments located in a modern building in Green Point. 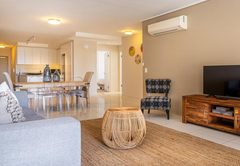 These modern self-catering apartments are a great option for families with children and for guests seeking a more private stay. Apartment 506 sleeps a maximum of three adults or two adults and two children. 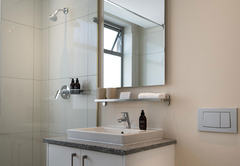 Has an open plan layout with a Queen size bed in the bed area and a bedsofa in the lounge. Apartment 404 sleeps maximum three adults or two adults and two children. It has a separate bedroom with a Queen size bed and a bedsofa in the lounge. Apartment 503 sleeps a maximum of three adults or two adults and two children. 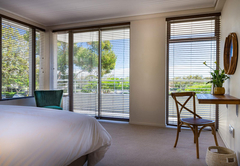 Has an open plan layout with a Queen size bed in the bed area and a bedsofa in the lounge. 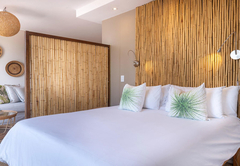 All three apartmentshave a beautiful Afro-Scandinavian décor, combining a natural palette with sisal and bamboo together with a modern touch. 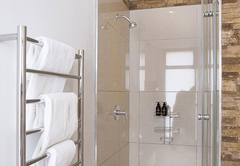 They also have a fresh en suite bathroom with complimentary amenities as well as a fully equipped kitchen with all the necessities to prepare your own meals. 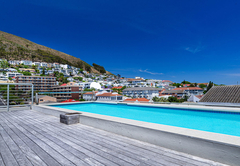 The Antrim Apartments come with access to a stunning rooftop swimming pool with sun deck and a typical South African braai area. Perfect for a sun downer or relaxing between activities! Use of the braai area has to be prebooked. Airport transfers with their own chauffeur can be arranged. Taxis, car rentals, safaris, tours and dinner reservations can be arranged by management. 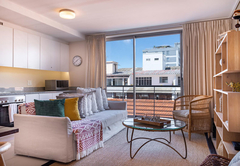 Green Point is a vibrant cosmopolitan area with various shops, restaurants and other amenities at a close walking distance. 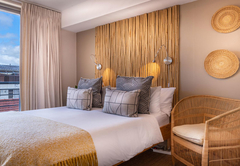 Cape Town's biggest gym, tennis courts and the ocean are just a short walk away. 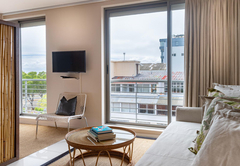 Also easily accessible are the V&A Waterfront, Cape Town city centre and the Atlantic Seaboard beaches. 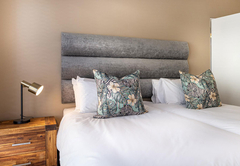 This is the perfect location for the business or leisure visitor requiring modern, clean, light-filled accommodation in Cape Town. Child policyChildren of all ages are welcome, with prior arrangement. 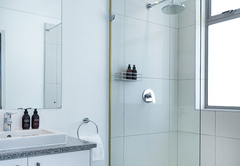 Rooms are charged at a levy for late departures and can only be arranged if and where possible. Be sure to check this when making your reservation.